Despite falling nationally since a peak in 2012, the rate of prescribed opioids remains high in many parts of the country. In 2017, there were 492 U.S. counties in which enough prescriptions were dispensed for every resident to have received one during the year. To understand how the landscape of prescribed opioids varies across the United States, the APM Research Lab developed a data visualization in partnership with Marketplace, and its podcast, The Uncertain Hour. In its 3rd season, the podcast is examining America’s decades-long “drug war,” leading up to today’s opioid crisis. 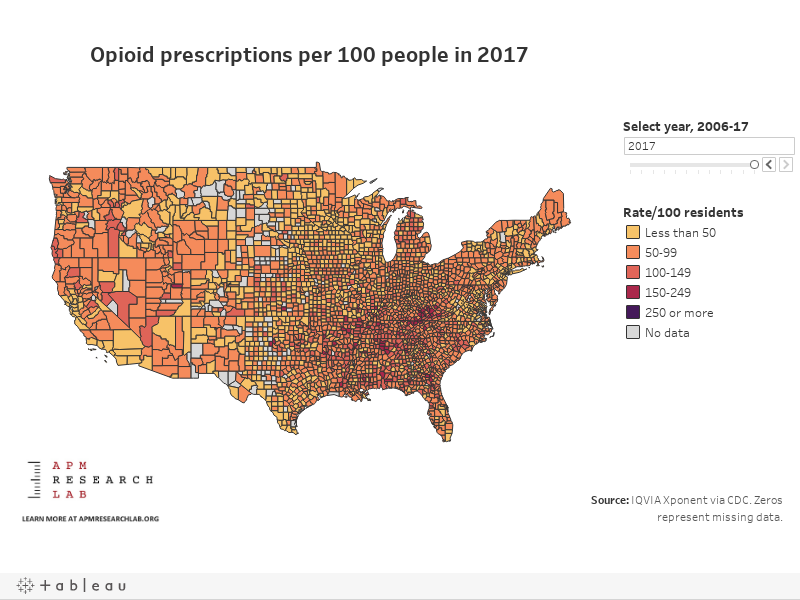 The interactive map below shows the level of opioids prescribed in “retail” (non-hospital) pharmacies relative to the size of the county population. Select a year or hover over any county to explore trends. Search using the magnifying glass icon at the upper left of the map. Source: IQVIA Xponent via U.S. Centers for Disease Control and Prevention webpage. Data are based on a sample of approximately 50,000 retail (non-hospital) pharmacies, which dispense nearly 90% of all retail prescriptions in the United States. Includes initial or refill prescriptions. Mail-order pharmacies are not included. Notes: Zero values represent missing data. This may indicate that the county had no retail pharmacies or none sampled, or the prescriptions were filled in an adjacent county. Map geographies are counties or county equivalents. Retail opioid prescriptions include buprenorphine, codeine, fentanyl, hydrocodone, hydromorphone, morphine, oxycodone, oxymorphone, propoxyphene, tapentadol, tramadol, and methadone. However, methadone used in treatment programs is not included. In 2011, Martinsville, Va., had the highest rate observed anywhere in the country over the past 12 years (for which data exists)--at 584 prescriptions per 100 residents, or nearly 6 for each person in a year’s time. Martinsville’s rate exceeded 400 prescriptions for 11 of the past 12 years, but fell below it for the first time in 2017 (to 336). Note: While Martinsville is technically not a county, it is a county equivalent as an independent city. In addition to Martinsville, Galax and Norton, Va., (both also independent cities) saw rates exceeding 400 prescriptions per 100 residents for six or more of the 12 years featured. They join Mingo County, W.V., as well as Floyd County and Pike County, Ky., in exceeding 400 at least once during the series, resulting in the highest opioid prescribing rates seen anywhere over these years. From their peak, Pike and Floyd counties have both reduced their rates by roughly half in the latest data (2017). And in an even more dramatic reduction, Mingo County’s rate was 6 times higher at its peak (437 in 2009) compared to its rate in the latest data (75). Despite falling nationally and in many counties, prescribing rates remain extremely elevated in certain parts of the country. In 2017, of the 2,955 geographies across the U.S. with available data, 14 counties or county equivalents had rates exceeding 200 opioids prescribed per 100 residents. The highest rates occurred in Martinsville, Galax, and Norton, Va. (named above). They were followed by Franklin City, Va.; Owsley, Bell, and Whitley counties in Kentucky; Emporia County, Va.; Walker County, Ala.; and Floyd County, Ky. In 2017, there were 492 U.S. counties in which enough opioid prescriptions were dispensed for every person to have one (i.e., more than 100 prescriptions per 100 residents). Nationally the opioid prescribing rate rose steadily following 2006 and then reached a high point in 2012 at more than 255 million annual prescriptions. This translates to a rate of 81 prescriptions per 100 persons—the equivalent of 4 out of every 5 U.S. residents receiving one prescription during a year’s time. The overall opioid prescribing rate has been falling since 2012, indicating that providers have become more cautious in their use of opioids. By 2017, the rate had fallen to 59 out of 100 residents (or 3 out of every 5 U.S. residents receiving one prescription during a year’s time). In sum, pharmacies dispensed more than 191 million opioid prescriptions in 2017. At the state level, the highest opioid prescribing rates exist in the southern and Applachian states. Why the concern about prescription opioids? While opioids are sold on the streets, more than one hundred million prescriptions for them are also written in doctor’s offices and clinics each year. The drugs are most commonly used to battle chronic or acute pain following surgery or severe injuries, or for treatment of cancer or other diseases. However, even legitimate medical uses for the highly potent drugs can lead to addiction and fatalities after extended or improper use. Between 2013 and 2017, an average of 46 U.S. residents died every day from overdoses involving prescription opioids, of which the most commonly prescribed are Methadone, Oxycodone (such as OxyContin®), and Hydrocodone (such as Vicodin®). Furthermore, researchers and others are questioning whether some doctors’ opioid prescribing habits may be influenced by payments from pharmaceutical companies. For healthcare providers, the serious risks of this class of drugs must be carefully weighed against the patients’ treatment needs.